In a world that is constantly changing, addressing today's safety challenges and anticipating those of tomorrow is the purpose of the new evolution lifeline by DBI-SALA. Whatever the work environment, evolution ensures the safety of the personnel in action without reducing their mobility, while complimenting the aesthetics of the buildings in which it is installed. Nothing stops evolution - it's not only a theory, but a part of everyday life . As specialists in fixed systems, DBI-SALA specializes uniquely in the domain of fall arrest, innovating constantly, as it has done for more than 30 years in this area. DBI-SALA supplies complete and tailor-made solutions to ensure safe access and work at height. The heart of the profession may concern personnel safety, but DBI-SALA has also maintained a focus on the design quality of its permanent systems. This approach, in addition to guaranteeing optimum safety, makes it possible for the systems to disappear into the environment. This is particularly the case with the new evolution lifeline, capable of integrating with architectural designs that are daring and innovative without jeapordizing the safety of the workers who are using it. When anchored to the building, the evolution lifeline offers great freedom of movement to personnel who are required to work at height. DBI-SALA designed evolution with innovation in mind - it is ideal for almost any structure, favors movements along the line, protects workers efficiently from falls, and is discreet - it blends into the structure without compromising architectural aesthetics. Innovative Design with perfect integration into the environment. Extremely compact components. With evolution, as fall arrest system expert, DBI-SALA is inaugurating a new generation of fixed horizontal lifelines and is breaking away from the market standards. For work on roofs or overhead cranes, operations in aircraft hangars, bridge maintenance or loading docks - all activities that call for many professionals to work at height. To maintain the greatest possible maneuvering freedom, it is essential for them to have access to a lifeline attached to the structure. This enables them to remain connected constantly so that they can carry out their work without ever needing to disconnect. Easily installed, evolution is a particularly flexible system for companies seeking the protection of their workplaces without any damage to the buildings or the structures into which the lifeline has to be incorporated. The Highest Quality Materials that resist corrosion for outstanding longevity. • Easy and precise installation on any type of structure: walls, floors, ceilings, outdoors and indoors. An extended range of absorbing or 'tip over' posts designed for installation on structures such as trapezoidal roof panels or standing seam roofs. In such cases, the posts reduce the forces and contribute to preserving the building. • An upstream simulation system : Design software has been developed specifically for evolution. By simulating the necessary clearances and possible heights of a fall, this software validates the compatibility of the structures with the lifelines no matter how complex. It verifies that the overall system is dimensioned according to the number of users and that the forces at the ends can be supported by the structure. DBI-SALA believes that the lifeline should adjust to the building - not the other way around. • Total adaptability For evolution DBI-SALA has developed a varied and extended range of curves, intermediates, and end brackets, enabling the lifeline to follow very accurately the lines of buildings while simultaneously addressing safety demands. A high capacity absorber makes it possible to use evolution on large single spans; this is an ideal solution in hangers or on unloading docks. The evolution lifeline can also be used simultaneously with a retractable fall arrest device. • High performance level thanks to a unique energy absorption method (LEAP) and the range of absorbers that can be adjusted to every lifeline configuration. • Professionalism for every situation - evolution is installed on site by DBI-SALA trained and approved installers offering overall service from initial layout study to periodic verification of the line, and even including user training. Backwards compatibility with former systems by Protecta, DBI-SALA, ensuring continued use of existing systems. 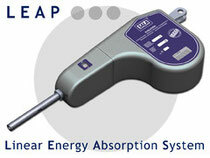 DBI-SALA has focused specifically on absorption in developing the L E A P system for evolution. Designed to offer a constant level of energy dissipation, L E A P enables the absorber to reduce forces linearly and smoothly. The calibration can be adjusted differently (to order), as per the specific configuration and use of the lifeline. This ensures that the system will absorb the amount of energy required to preserve the safety of workers and structure alike. In addition, and this is an innovation, this absorber is capable of tolerating several successive falls. Fluid Circulation Smooth movements on a straight line or on curves.